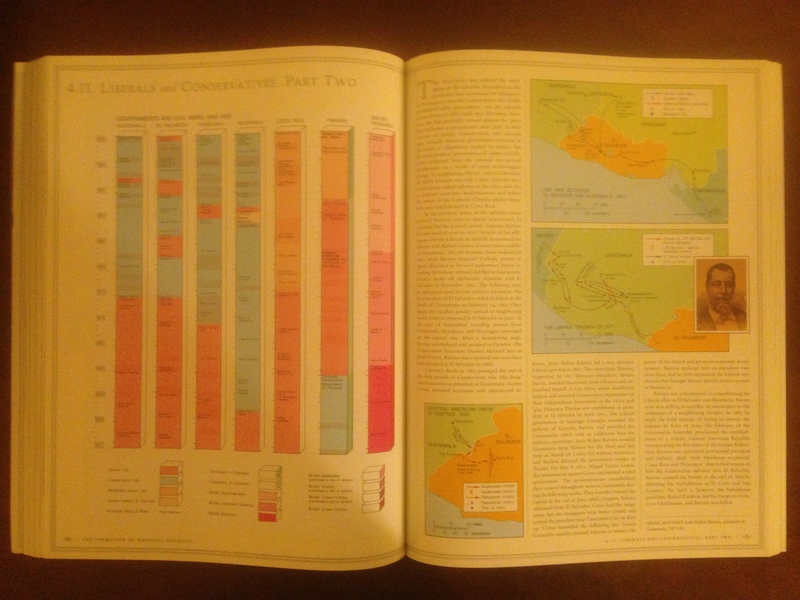 With the permission of Dr. Petrik, instead of using one of the U.S. atlases for my evaluation assignment (directions here), I’m using the Historical Atlas of Central America by Carolyn Hall and Héctor Pérez Brignoli, drawn by John V. Cotter. Hall is a retired professor of geography at the Universidad de Costa Rica, Pérez Brignoli a professor of history at the same university, and Cotter a professor of geography at Southwestern University. 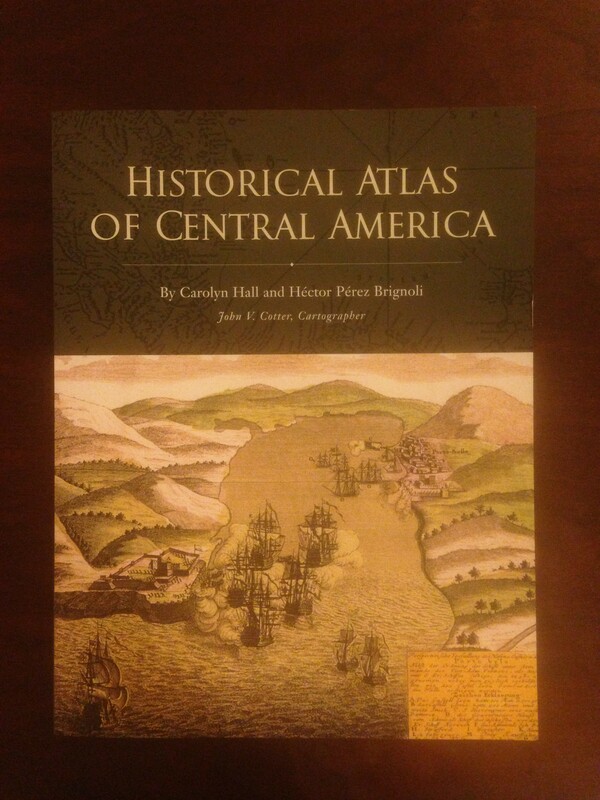 In their detailed preface, the authors explain that they intend the atlas as not merely a collection of maps but a synthesis of the history of Central America, both of which they argue are lacking. They lay out the argument of the atlas and historical synthesis: that Central America has been an important region in world history, but one often ignored. Admittedly, I’m not sure I would have picked up the book had I not spent ten months living in Central America. The authors present a hybrid thematic-chronological approach to the atlas. Chapter 1 discusses and shows the geography–natural and human–of the region, then proceeds to a synthetic overview of the evolution of its political boundaries. Chapter 2 presents a broad overview of the isthmus’s human history, from the first migrations to the present. Chapters 3-5 then focus, respectively, on the colonial era (mostly Spanish but with some British), nineteenth century, and twentieth century, focusing more on specific stories within each country. Throughout, political, natural, and social history are mixed. A chart of governments of the 19th century. As both a historical synthesis and an atlas, this book works for me. 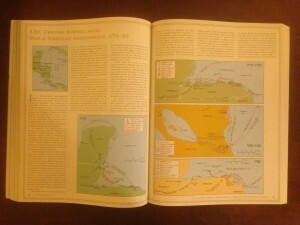 One can flip through and get an idea of Central American history by looking at the maps and accompanying images. The authors also include charts, such as graphs showing the political history of the seven countries in different eras, such as the late 19th century (photo). The page on the U.S.-American Revolution. This comprehensive masterwork is not without its faults, though. The statement about one being able to flip through and get an idea of Central American history by looking at the maps is mostly true, but not completely. In portions, the atlas is dependent upon the text, such as in its description of the effects of the U.S.-American Revolution on Central America (something I’m sure most of us didn’t know!). To understand the military maps on these pages, one must read the text. Each two-page spread is chock-full of text–some spreads more than others. At times, the text can be dry–more of a list of facts woven mostly into a narrative. Graphically, the design is solid. The cover presents a historical feel, and the text inside the atlas is clean. The maps and pages are neatly contained within a frame around each two-page spread, rather than bleeding to the edge. The neutral color scheme provides historical gravitas to the atlas and, perhaps more importantly, avoid exoticizing Central America. 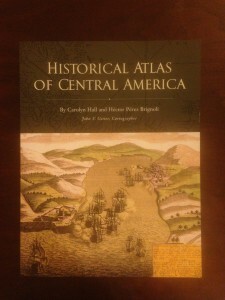 In fact, the design could be used for almost any historical atlas, not just one about Central America. The maps are clear and consistent. They do a fine balance of giving one an idea of geographic location without over-emphasizing political borders. In the U.S.-American Revolution spread, for example, the cartographer’s plain maps work to draw one’s attention to the military operations. 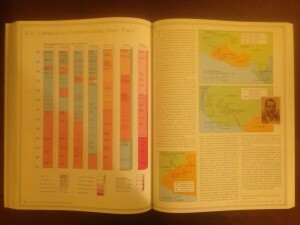 Other spreads, however, have much more richly-detailed, colorful maps, depending on what they show. That said, this is certainly a noble effort and a must-have for any Latin Americanist’s bookshelf–or simply the bookshelf of someone who wants to know about the history of a region from which so many people in the United States now hail. 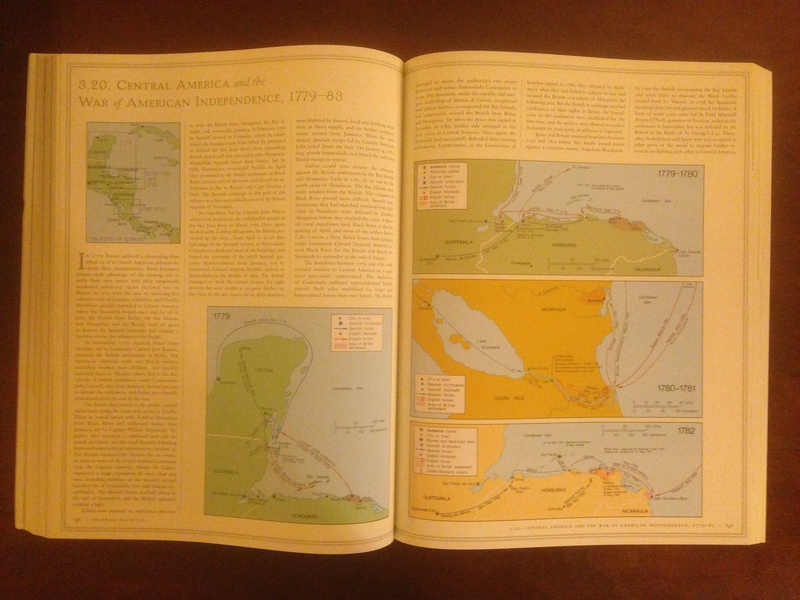 While the text is dry at times, one could read this atlas–both the text and the maps–in place of other syntheses on Central American history and gain a comprehensive overview of the region. Thus it fulfilled the goals of the authors. That said, as a general statement, I’m not sure that I would first turn to an atlas for a synthesis; indeed, when I was looking for a synthesis on Central American history a while back, I looked at another book I found at a book sale, rather than this one, already sitting on my shelf (I should note that I found this one superior to the other one I read). I’m curious how many people read an atlas cover-to-cover–something we should consider as we create our own atlases. You bring up a very poignant question of who reads an Atlas cover to cover? Perhaps more what can be more broadly asked is who reads an atlas at all? I admit to be something of a collector of coffee table books on a variety of topics, but have always found the form biased to the image rather than text. The physicality involved with the textual reading of most atlases is a bit cumbersome. We must contort the body or flex our wingspan to hold up the multi pound tome. If the text is necessary to understand the images, how may design persuade a viewer of the atlas to read rather than just glance from picture to picture?